Deadly typhoon Lionrock has continued to cause havoc along the west coast of the North Pacific after killing 30 people in Japan earlier this week. In North Korea the Red Cross reports that more than 300mm of rain were reported between 29 and 31 August, causing flooding of the Tumen River and its branches in this region around the Chinese- North Korea border. Reports indicate that Hoeryong City is greatly affected with over 2,000 houses inundated or submerged and over 1,000 houses completely destroyed. The Red Cross reported ten deaths, with a further 15 people still missing. Unconfirmed reports indicated that 17,182 households have been affected by the floods. It is estimated that more than 9,088 houses have been damaged, and over 8,094 houses destroyed. Up to 44,009 people are reported to be displaced. In China Typhoon Lionrock was also the cause of flooding that struck parts of eastern China according to China’s Ministry of Civil Affairs (MCA). Officials from MCA say that just fewer than 1 million people were affected in total, with around 44,000 forced to evacuate areas in Jilin where over 1,100 homes were damaged or destroyed. Around 200 homes were also damaged or destroyed in Heilongjiang province. In Russia the governor of Maritime Territory (Primorsky Krai) declared state of emergency in the region after torrential rain and flooding from 29 August 2016. Russia’s Emergency Ministry, EMERCOM, says that the equivalent of around 3 months of rain fell in the days between 29 and 31 August. Typhoon Lionrock made landfall on 30 August near the city of Ofunato, Iwate Prefecture, Japan. 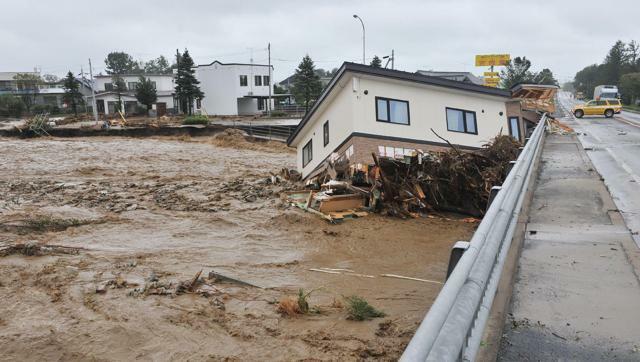 The storm caused heavy rain causing deadly floods and landslides. Authorities in North Korea reported severe flooding in North Hamgyong Province from 29 August. In China, Lionrock caused flooding in the provinces of Heilongjiang, Jilin, central and northern Liaoning and eastern Inner Mongolia from 29 August, affecting 950,000 people. Flooding was also reported in Primorsky Krai in the Russian Far East.